Are you having trouble sticking to your new year’s resolution to exercise more? Maybe you need a good physical trainer to help meet your fitness goals. Have you considered your best friend? Research shows that dogs are actually nature’s perfect personal trainers. 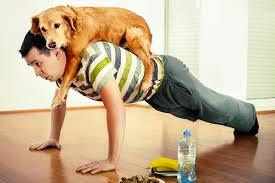 Dogs are naturally loyal, hardworking, energetic and enthusiastic…basically the perfect work-out partner. And, unlike human workout partners who may skip an exercise session because of appointments, extra chores or bad weather, dogs never give you an excuse to skip exercising.